Some people love water and others wish it was more flavorful. I am in the "love water" camp, but many of my readers are not. I get many questions about ways to make water taste delicious without adding any calories - especially from the Diet Coke addicts. I hear you because I used to drink Diet Coke every day myself. You can catch me on an airplane now with a Coke Zero - but other than that I don't drink it anymore. Keeping hydrated is incredibly important because your body depends on water for survival. You will die of thirst way before you will die of hunger. Water makes up more than half of your body weight and you can get seriously grumpy without it. So, what can you do if you don't like plain water? 1. Buy some peppermint extract and a medicine dropper and make your own "Mint" water. The extract adds zero calories and a refreshing taste. 2. Try the book "Cool Waters" by Brian Preston-Campbell. The photo above is taken from it - here is my post and a recipe from the book which includes 50 tasty water recipes see: How Do You Like it? Water Enhancer With or Without Chemicals. 3. Give flavored seltzer a chance (without artificial sweeteners) if you can find it see: A Refreshingly Sweet Zero Calorie Beverage With No Artificial Sweetener. 4. Get a SodaStream and make your own seltzer. They even have flavor enhancers you can buy without artificial sweeteners - see Soda Stream USA. 5. Squeeze a lemon or lime in your water or buy a powdered form called True Lemon (there are other flavors too). There are no preservatives, artificial colors etc. see: True Lemon. 6. Dilute your juice. Try cutting your juice with water and see how little juice you can use to make it taste good to you. Over time, use less and less juice. 7. Try a fruit flavored herbal tea. There are some great caffeine-free flavors such as peach, blueberry, and apple. Brew some up and chill it. 8. Buy a water infuser and some fresh fruit. See the pitcher below. You add fruit to the center which is filled with holes and you can refill the water when needed. How do you make water tastier? I slice up a citrus fruit or some cucumber, put it in the bottom of a container and keep refilling it with water all day. The flavor quickly infuses the water and it keeps be drinking it all day. Watermelon is on my list to try, but haven't done it yet. I am in the "Love water" group but my hubby isnt quite there yet! I bought the Prodyne Fruit Infusion last year and LOVE IT!!!! Also gave them for Christmas gifts and everyone loves it!!! I'm interested in one of those flavor pitchers. The people I know who have one say it works well and tastes great. 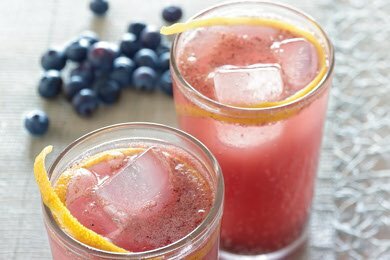 You can add a lot of different kinds of fruit at once and make a cocktail of flavors. I squeeze some lemon (or apple cider vinegar), bit of raw honey and dash sea salt. It's a homemade sports drink. Can also add mint leaves if you'd like too. I raised my kids on "diluted juice" ... so much healthier than full strength juice because of all the sugar. They still drink it as adults today (and so do I). LOVE these tips! Thanks! I recently found a cool product called Capella drops. They make a range of flavor drops for coffee, tea and water with no calories. I say this as I am drinking a glass of water with their Green Apple drops. Delicious! They have many other flavors such as New Your Cheesecake, Amaretto, Toasted Almond...etc. I even use it with my oatmeal, and in my greek yoghurt, too. You can check them out at http://capellaflavordrops.com/. It's been a boon to my current healthy eating plan! Does anyone drink CASCADE ICE? 2 calories - naturally flavored sparkling water with fruit juice (1%) - ZERO sodium, caffiene, fat, protein, carbs, sugar. Comes in 17.2 oz. bottles and has fizz which is satisfying to us diet-Pepsi addicts!!!! Oh, and those Capella coffe and tea flavoring drops contain no fats, calories, carbs, and sweeteners. The water drops contain a touch of Stevia.... Chocolate Raspberry, Orange Creamsicle, Peppermint, Gingerbread, Marshmallow ..... each little dropper pack contains over 75 drops. I've been using my flavors for over a year and they are still going strong! Yep, I am currently trying to kick the Diet Coke addiction....10 days now! Woo hoo! I get unsweet tea with cranberry at Sonic....not sure if it has any calories....it does still have caffeine...but I enjoy it!! Try Wyler's individual packets to add to a 16 oz water. Easy to carry, s/f and $1.00 a box for eight. I do not drink caffeine and need sugar free (diabetic); they are a great way to diet and stay caffeine free. Walgreen's & Dollar Store usually carry them. Love the Kiwi/Strawberry & they now have a half-lemonade/tea w/o almost no caffeine. Much better than Crystal Lite which I cannot use. If all else fails, I put lemon in water when eating out. I also love just plain, pure water. But I also do not mind if with some fruit in it for extra flavor. This past summer I made a large pitcher with a couple of watermelon wedges in it. It was the BEST water I have ever had (and I'm not the biggest watermelon fan). What did you do to the water in the picture advertised? Looks delish! and it has blueberries and lemon. Thanks for the question! I drink Crystal Lite all the time. I love the original lemonade and pink lemonade. They quich my thirst and no points are used :). I love cucumber in water. Had it at a baby shower. So refreshing! The outrageous prices for all the powdered/liquid flavor enhancers will keep me hooked on water! Just found out that I love diet tonic water! Does anybody have any recipes for water that has a similar bite? I have 24 quarts of home canned pure grape juice. I dilute it with private well (not city) drinking water 1:1 so I have 48 quarts of juice. Does this degrade the antitoxins in any way?